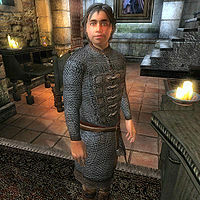 Maro Rufus is an Imperial smith and joint owner of The Best Defense in the Market District of the Imperial City. He sells light armor and offers repair services. He shares ownership of the store with heavy armor specialist Varnado, but that is the only thing they share. Both of them dislike the other's preferences in armor to such degree that even their resident master smith Gin-Wulm prefers to stay out of the store. Maro sleeps in the basement and gets out of bed every morning at 6am. He always starts the day eating a two-hour breakfast with Varnado before opening the shop at 8am. He spends the next twelve hours offering his services to customers, before finally closing up at 8pm. At 8pm during the week (Morndas to Fredas), he spends the evening at the Merchants Inn, eating and drinking until midnight. On Loredas, he leaves the District and goes to the Temple of the One for four hours of praying. On Sundas, he adds two extra hours to his usual service time before closing up the shop at 10pm. On this particular day, he also extracts two hours from his usual sleeping time and heads to bed at 10pm. He wears a chainmail cuirass (which he takes off when he sleeps), a pair of quilted shoes, and tan linens. He carries around the shop key and a large sum of gold. Maro definitely believes that the best kind of defense is light armor, and he won't even mention his partner when greeted: "The Best Defense! That's me, Maro Rufus! Light Armor! The very best!" When asked about the city, he will reluctantly point you towards Varnado: "Well, if you MUST have Heavy Armor, see Varnado. So heavy, so ugly... but it's your choice." Fellow citizens will point you towards him if in need of light armor: "If you need light armor, talk to Maro Rufus at The Best Defense." Maro was supposed to go to bed every night at 10pm, but his bedtime package only activates once he is done with his other evening activities, causing him to go to bed at midnight instead. He keeps the shop open on Sundas because there is no activity package for that particular evening, causing him to keep doing what he is doing; as a result, his bedtime package finally activates at 10pm like it was supposed to. Maro was also supposed to stroll around the Arboretum on Loredas. However, this package has the same conditions that oblige him to offer services. Since the package to offer services is before this on the list, he will never perform this action as the former will always take priority. Esta página foi modificada pela última vez à(s) 02h46min de 11 de julho de 2013.